I attended the Voices of Wisdom event, held in near Toronto, Ontario, Canada on September 24 and 25, 2016. The event featured the elders Kahontakwas Diane Longboat, Mohawk elder, and Wanbdi Wakita, a Dakota elder. Both of these elders are spiritual leaders in their ancestral communities, and leaders in their professions in the greater community. Diane greeted us with a delightful, warmth and openness. Her most memorable words for me were when she said that we are all indigenous. She sees that the role of the First Nations people is to help all of us remember our ancestral wisdom. I was in tears. She addressed a longing in my heart. She invited us to be leaders in our professions by upholding the heart vision of connection to the land and to Spirit. She said that this is the way forward. She also talked about Haudenosaunee history. She described a directive given by George Washington, to massacre and drive her people off their ancestral lands in New York State. I grew up both in New York State, and near her home, the Six Nations of the Grand River Territory, in Ontario. I was shocked and angry that I had not been taught this in school. She also described ways in which Canadian laws have continued to disenfranchise indigenous peoples. Wanbdi’s warmth and humor emanated from him as he told stories of his early life, surrounded by his family, his language and his traditions. He said that he had gone to Europe as a soldier for ten years in his twenties, and saw that it was not until he returned to his land and his people that he felt a connection to Spirit. He described helping build a prison in northern Canada. He gave blessings to the land, and held in his being throughout the process of his prayers that the inmates were children of the great Creator, with hearts that needed healing. He announced that his wife, Pahan Pte San Win, had a vision to have a Sun Dance for women. This Sun Dance is to help the women and families of the thousands of murdered and missing indigenous women in Canada, to grieve their loss. He invited us to participate in the dance or be a supporter. It will be in August 2017. At our event, many of us were moved with emotion and inspiration for this opportunity. 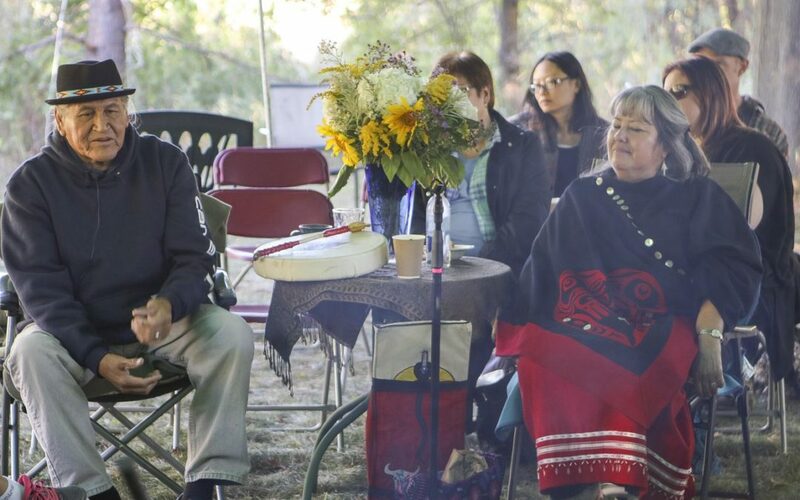 At the follow-up Sunday evening event, led by our Sacred Fire Community firekeeper Mai Duong, we shared insights and expressed feelings of grief, anger and joy elicited from experiencing the elders’ stories, songs and vision. A woman said she cancelled a contract at her workplace because she felt that it did not have the integrity of her heart that she had understood from the elders. Others shared that their relationship with the land and Spirit was opened by this extraordinary time shared with the elders.